Henry Thomas Austen (1771 – 12 March 1850) was a militia officer, clergyman, banker and the brother of the novelist Jane Austen. Henry Thomas was born at Steventon, Hampshire, the fourth of the eight children born to Rev. George Austen and Cassandra Leigh. He had five brothers; James (1765–1819), George (1766–1838), Edward (1768–1852), Francis William (Frank) (1774–1865), Charles John (1779–1852), and two younger sisters, Cassandra and Jane. He matriculated at St John's College, Oxford in 1788 and received an MA in 1793. In 1789-90, he edited and published with his brother James a literary magazine, The Loiterer. In 1793 he joined the Oxfordshire Militia, rising to captain before resigning in 1801. 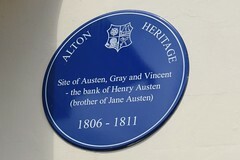 In 1804 he founded, with two associates, the bank of Austen, Maunde and Tilson in Covent Garden, London. It went bankrupt in 1816. He entered the church that same year and was made curate of Chawton, Hampshire. In 1820 he was made Rector of Steventon. He arranged the publication of Northanger Abbey and Persuasion after Jane Austen's death in 1817. In Paris on the 8th of July, 1819, he baptised the George V, future king of Hanover with Anglican rites in a hotel which his parents were staying in. He died in 1850 and was buried in Woodbury Park Cemetery, Tunbridge Wells. He had married twice; firstly his cousin, Eliza Hancock, Comtesse de Feuillide, a widow and secondly Eleanor Jackson.